Tension headaches are one of the many ways that stress can affect your health, and this type of tight or throbbing head pain can be debilitating. Fortunately, there are a number of effective treatments you can perform at home to ease the pain. According to the World Health Organization, tension-type headaches are more common than any other kind of head pain. They affect more than 70% of the population and plague three times as many women as men. Tension headaches can range in duration, typically lasting between two hours and several days. Fortunately, there are some things you can do to reduce the duration of your headache and get back to you daily activities. The University of Maryland Medical Center recommends using over-the-counter pain medication to treat a tension headache at home but cautions that there are side effects to all medications. Before you choose an over-the-counter pain reliever to treat your headache, talk to you doctor about which product is best for you and any health conditions you may have. Many practitioners believe that acupressure can help with a variety of health conditions, including tension headaches. According to Dr. Oz, you can use a number of different pressure points to relieve your headache. Extend your right hand. With your palm down, hold your thumb so it is lined up with your other fingers and makes a crease in the fleshy part of your hand. Using your left hand, place your left thumb on the end of this crease. Place your fingers directly opposite it on the underside of your right hand. Using your left hand, pinch the fleshy part of your right hand quite hard for a period of a minute or two. Your headache may feel better. An excellent way to relieve the pain of a tension headache is through massage. Gently use your fingertips to massage the muscles in your neck, head, and shoulders. 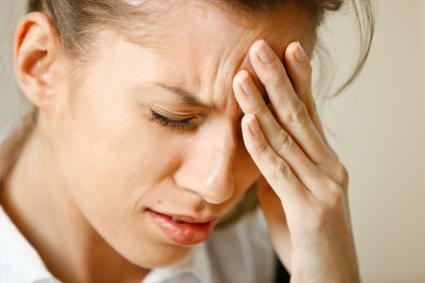 Some headache sufferers find that massaging their temples helps to relieve the pain. You can do this yourself or have someone else massage the area for you. According to TLC, coupling aromatherapy with temperature-based remedies can also help. For many people, a cool cloth or an ice pack can help relieve a tension headache. For others, a hot compress, a bath, or a soothing cup of herbal tea does the trick. Alternating between warm and cold is another option. If your stress headache is related to vascular problems, you can also try soaking your hands in hot water infused with essential oils. Stand up or lie down flat. Take a deep breath, concentrating on breathing from your abdomen. Hold the breath for a few seconds, and then exhale. Take a short ten-minute walk outside and breathe deeply while walking. Find a quiet place to relax and meditate. Take a hot shower, allowing the water to flow over your neck and back for several minutes. Stretch the muscles in your neck by gently rolling your head. Lie down for a short nap. These may be signs of a more serious medical condition. Although a headache is painful and even debilitating, it is also your body's way of telling to take it easy. Take a moment to listen to your body and try one of these home remedies to improve your symptoms. Chances are, you'll be feeling much better soon.